I have no idea man. It will probably come and go without much fanfare. 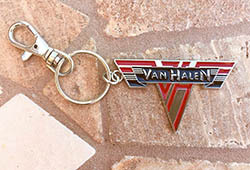 My guess is you won't hear anything from Wolf until plans are set for whatever VH is doing this year (or next). Dweezil Zappa has been around for decades. If he came out with what equates to a "single", it wouldn't make waves. Hence these guys all tour off back catalogs. Practically zero money/interest in new music from this type of artist. Now if he changed his name to like G-Wolf-Eazy and purchased a grill for his teeth, perhaps he could get some publicity on TMZ. Here’s an interview with Sammy’s son Drew, an aspiring musician, he talks a little about Wolf. Speaking of Wolfgang this popped up on YouTube. He seems like a really nice young kid here. The interviewer is a douche though. "I think for everybody that’s in our position, people just assume we were born with silver spoons in our mouths. But everybody has their own struggles dealing with getting out of the shadow, you know, and it’s really hard." "I only started playing music seriously three to four years ago. One of the first things I ever got to do was go on tour with Kris Kristofferson, opening up for Willie Nelson which was incredible." Last edited by EJC; 02.06.19 at 01:50 PM. Will the 2015 Summer Tour Finally Be The End of Wolf in Van Halen?